I love that it is full of topography making each neighborhood really unique. The historic architecture, groves of beautiful trees, and I may be in the minority here… the sound of the trains. I attended Andrews University in Berrien Springs, MI where I received my Bachelors and Masters in Architecture (2003). I worked at Eckert Wordell Architects until 2005 when I returned to school to include a Post-Graduate degree from University of Notre Dame – Master of Architectural Design and Urbanism. I spent a nearly a year overseas between school in Rome, and an architectural internship with Robert Adam Architects in Winchester and the Prince’s Foundation in London. I worked on many architectural and urban design projects. At the Prince’s Foundation I helped to complete the design and marketing of a book called “Tradition Today”. After graduation in 2007, I moved to Pittsburgh, PA and worked for Urban Design Associates until 2008 – I was laid off during the economic crash. I moved to Orlando, FL to work for Glatting-Jackson, a landscape architecture and transportation urban design firm. I moved to Denver, CO 3 months later to help open their new office. I spent 3 years with Glatting, including the transition as the firm was acquired by AECOM. I was laid off in 2010 by AECOM as the economy generally lagged along. I set up my own firm and consulted with rural planning departments in southern Colorado for 3 years. I returned to Kalamazoo in 2013 and started working for LSL Planning in Grand Rapids, MI. I joined the City of Kalamazoo as the City Planner in late 2014. I became Director of CP&D in 2016. 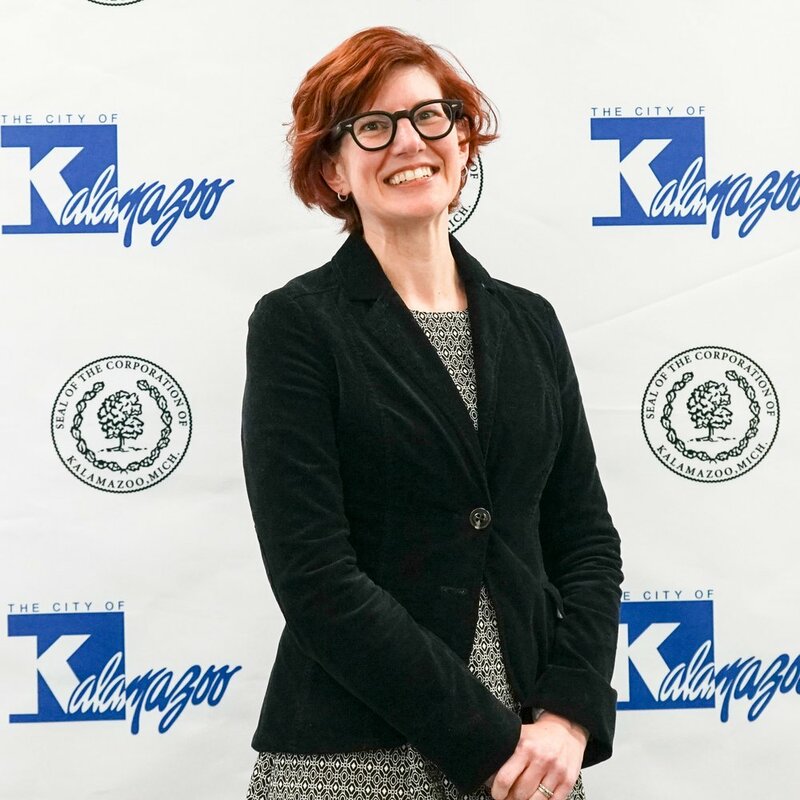 Recently, through several initiatives including Imagine Kalamazoo and Redevelopment Ready Communities Certification, the department of Economic Development has merged to create Community Planning and Economic Development. o Any Biography (obsessed with them) – currently reading “Leonardo da Vinci” by Walter Issacson; my favorite biographer. No question – a unicorn. Always has been. I had hundreds of unicorn stickers as a kid. All put into photo albums. When I was 10 my mom gave me a unicorn she had made for me. It was as big as I was then… I still have it. Unicorns always represented that head-in-the-clouds attitude I sometimes have. Most of the time, when it comes to a challenge, I approach problems with childlike curiosity. To that end, people might think I’m a bit simple and definitely not the norm in government work. But, I believe that anything is possible if you work hard enough to follow through and be sure to get people involved. If a community wants something done, we have to find a way to do it together.